Another year over. A new one just begun. What have you done? John Lennon would have been 75 in 2015. My Mum would have been 71, but she passed away in 2014. The last year and a half have been very odd, knowing that Mum and Dad will not visit Phuket again. They came here many times, first in 2002 and the last visit in 2013. In 2014 I visited England twice, and in 2015 I was there again to see my Dad and do some work clearing out their house. Dad has dementia and right at the end of my visit we got him moved to a very good care home where my aunt and cousin both work. So that was a load off my mind. 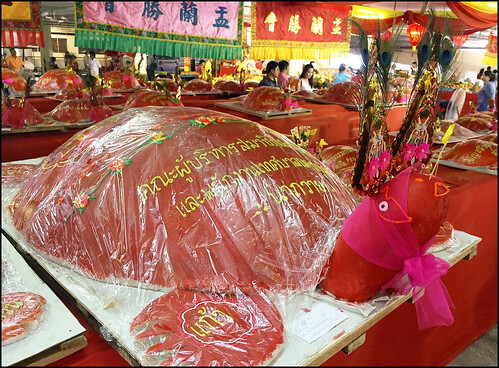 Until my visit in September, the blog had been rolling along nicely with lots of new posts, but since September, the only thing I blogged about was the vegetarian festival which took place in October. Towards the end of 2015 I had little time to blog due to running a busy dive shop, and have not really felt in the mood, plus I had a couple of weeks feeling ill in November, so over the last couple of months we've not done much or felt like doing much except relaxing on days off! In high season I am in the dive shop 6 days per week - come to see me at Sunrise Divers! Let us begin at the beginning. All the way back in January 2015. A very nice month with visitors from the UK so did quite a few trips out and about including visiting the Big Buddha, the Sunday street market in Phuket Town, the After Beach Bar and a trip I did with my aunt and uncle around the south of Phuket including Rawai Beach, the Karon viewpoint, Phromthep Cape and Ya Nui beach. 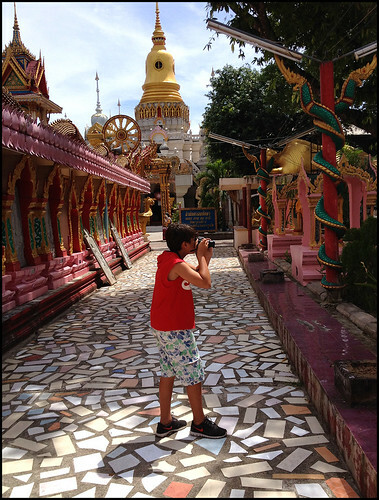 Later in January we did one of our days when we just "go for a drive" with only some vague ideas, and we found our way to Tone Pariwat Waterfall, and then enjoyed the Sunday market in old Takua Pa Town - about 100km north of Phuket, an easy enough day trip. 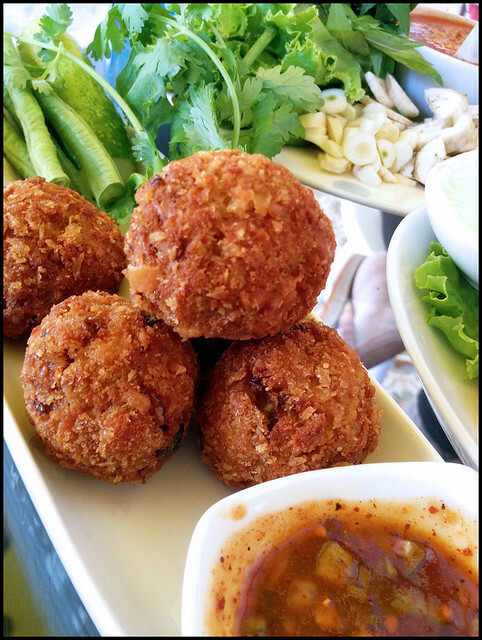 During the early part of 2015, I wanted to blog a few new restaurants, and so we did plenty of eating out :) We found some good places to eat around Phuket Town - check out Krua Suan Cha which isnear the football stadium, Zaab Kafe and Eleven Two & Company which are both in/near the old town. In February we did a very nice day out in Phang Nga with my cousin and his wife and their young son, plus my wife's cousin's son. 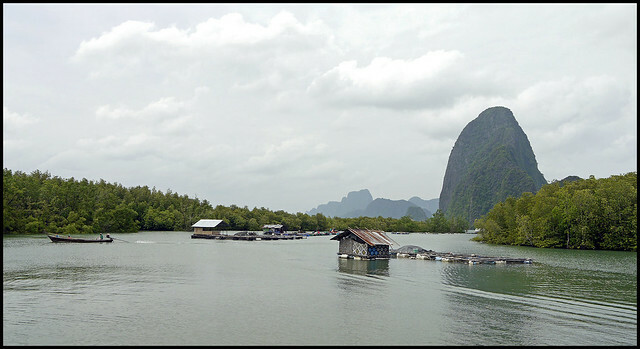 We have done trips in Phang Nga Bay many times, this time we got perfect weather for an afternoon trip including Panyee Village (the fishing village on stilts) and James Bond Island. 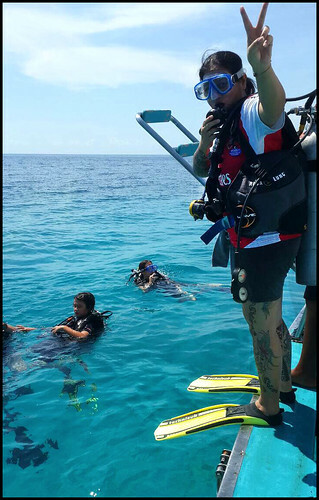 I think this is my favourite day out from Phuket. 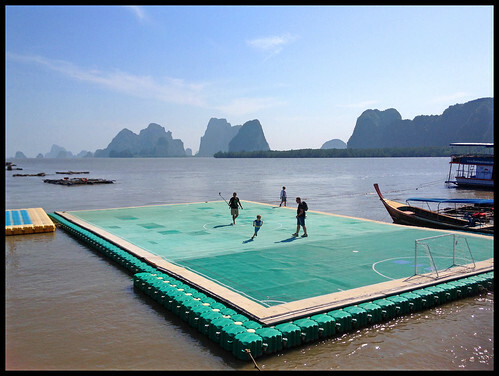 Read more - Phang Nga Bay Tour. 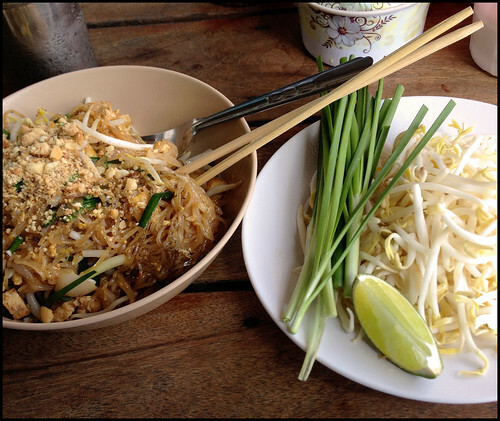 During May and June, there was more food - I blogged Lucky 13 Sandwich near Rawai Beach and re-blogged the well known Phad Thai Shop on the back road of Karon Beach. (above) Best Phad Thai in Phuket? 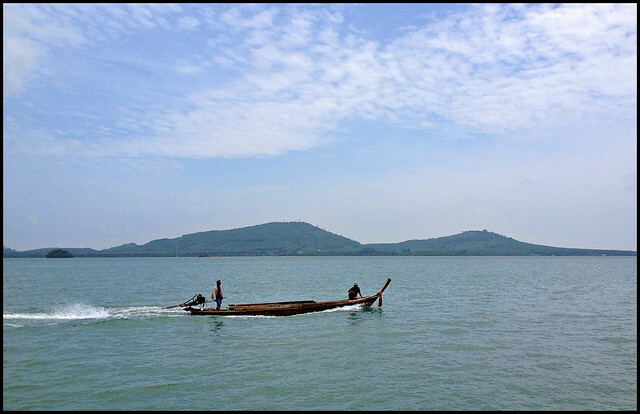 And in June we were in Phang Nga again visiting Bang Pat fishing village. Was a bit of a grey day, so I'd like to go again with some sunshine, but the grey skies did not dim the smiles. At this point, I'd like to say .. I wish I was on holiday here and had many more days out! But of course I am living a kind of "normal" life here with a family, kids, bills to pay and a full time job. Sometimes when I am not working we have days out and sometimes we just do what the kids want. 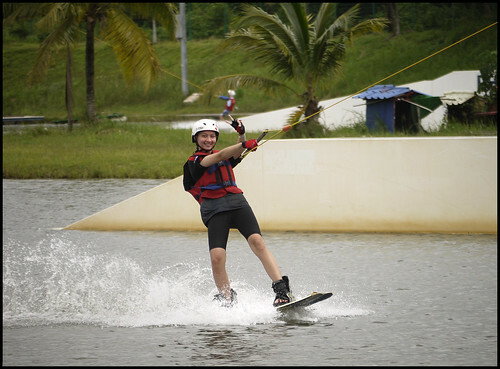 2015 their favourite thing was wakeboarding, so I have updated the Phuket Wake Park page on the blog (it still needs more updates). In August we had probably the best weekend of the year. Amazing weather, middle of low season, and we went white water rafting in Phang Nga, followed by a night in Khao Lak by the beach. 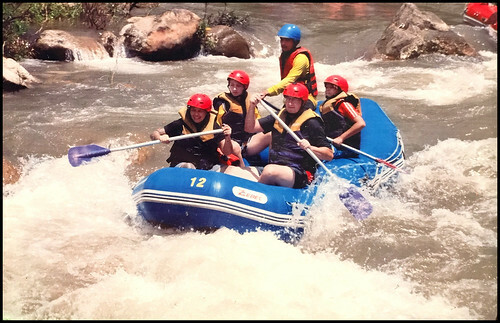 I've done rafting in the past in Africa, Chile and the UK, but it was a first for the family .. a lot of fun - see White Water Rafting. 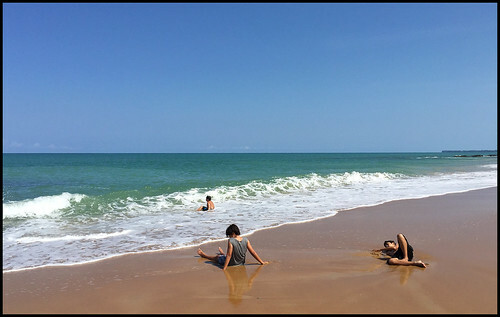 (above) My boy and his buddies chillin' at the beach in Khao Lak, August 16th 2015. We stayed at The Leaf By The Sands hotel, very nice - see One Night in Khao Lak. 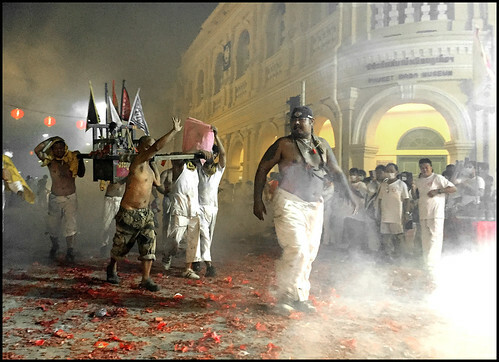 Later in August, we had the Por Tor Festival in Phuket Town, also called the Hungry Ghost Festival. I'd not seen any of this festival for a few years. It's a real slice of culture. After this festival, well, I was off to England for a couple of weeks, returning for a week in the dive shop and then we had a family holiday in Chumphon, Hua Hin and Kanchanaburi. One of these days, I may start a "Jamie's Thailand" blog! We've been to Hua Hin multiple times, we have a house in Chumphon, but this was a first time in Kanchanaburi and we'll be back there in 2016! 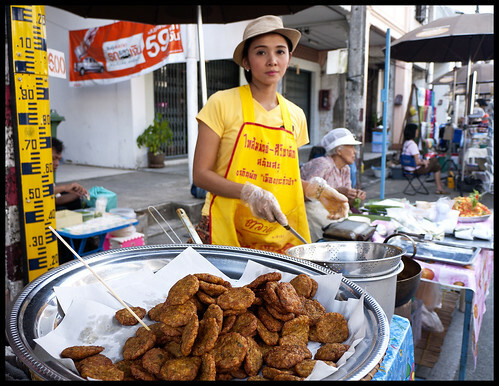 Back from holiday, the vegetarian festival had already started and I went to the Kathu shrine on October 20th very early in the morning, saw some slightly crazy stuff and watched the street procession head to Phuket Town - see Phuket Vegetarian Festival 2015. And on the last night of the festival I was in Phuket Town. The last night is nuts. I only attended for the first time in 2014, and will be there again in 2016! 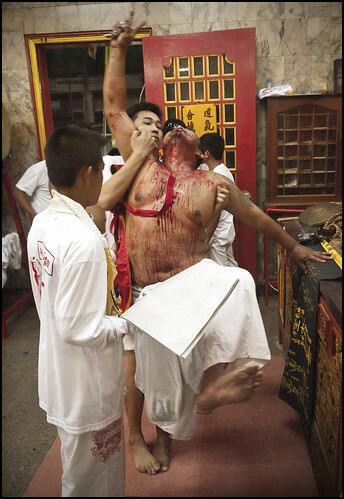 See - Last Night of the Phuket Vegetarian Festival. So actually, since this I have not posted anything new. But there is new stuff coming! We just found a new viewpoint a couple of days ago, and I feel my slight malaise has lifted with the new year. During the year there are many things that don't get blogged. We have trips out and I take a few photos or we eat at regular places that are already blogged. Often I post new photos on social media - please do follow me on Twitter or Instagram. An example below of something that was not blogged, a couple of weeks ago .... in a galaxy far, far away. We went to see the new Star Wars. May the force be with you! See you in Phuket! Happy New Year!